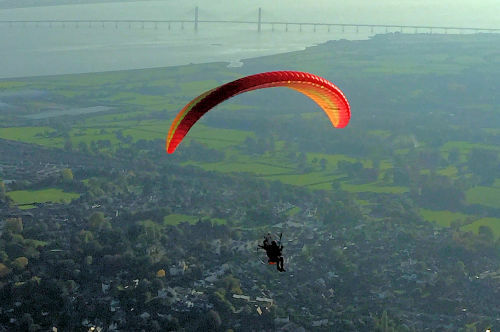 How far can a paramotor fly? When weight has to be kept to a minimum, and fuel tanks need to be tiny, it can't be that great, can it? The range a paramotor can fly depends on a lot of things, but with the right choice of paramotor and ideal conditions, you'll be surprised at just how far you can travel. 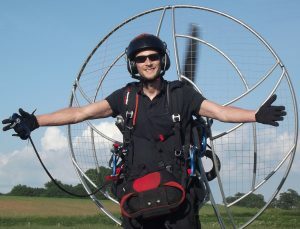 In this post we'll look at how the choice of engine can determine the range a paramotor can fly. We'll find out how different wings will have a massive effect on this range, and we'll find out the best paramotors to buy if you want to fly long distances. When it comes to choosing your power unit, you'll have a choice of three different motors: a 2-stroke engine, a 4-stroke engine, or an electric motor. Each of these have their pros and cons, but you'll need to choose wisely if you want to maximize your flight time. Electric motors have their advantages, but with battery power limiting flight time to around an hour, they have no place in this post; at least for the time being. 2-stroke engines are still the most popular choice amongst pilots, but they can be thirsty. One of the most popular engines and my current choice, the Moster 185, will guzzle around 4 litres of fuel per hour. This isn't terrible, but it's certainly not the best. The problem is, if you want better fuel consumption, you'll have to sacrifice power, you can't have both! So what reliable 2-stroke engine offers the best fuel consumption? I'm going with the Miniplane Top 80. This engine isn't the most powerful motor on the market, but it's very efficient, and will only use between 1.5 and 2.5 litres of fuel per hour. We'll come back to this engine later. 4-strokes produce their power at a lower RPM, this means that you don't have to rev them as much as a 2-stroke. Less revving means less fuel is used, and 4-strokes are known for being more fuel efficient. The problem with the 4-stroke is that size for size, it only produces about half the power of a 2-stroke. This means that a smaller 4-stroke engine that would be needed to match the low fuel consumption of the Top 80 would lack power. EOS are currently working on a 4-stroke engine that they claim will only drink 2 litres per hour! Not quite as good as the Top 80, but still awesome for a 240 cc engine, and it will have much more power than the Top 80. It's been a long time in the making, and no updates have came in a while, but I will update this post as they release more information. So the Top 80 2-stroke wins the battle for the paramotor engine with the best fuel consumption. Notice the title above says how long can you fly, not how far. Your range will still depend on a few other factors that we'll get to later. Paramotors have pretty small fuel tanks, and the biggest you can expect from a foot launched machine is 14.5 litres. But if you could get 1.5 litres per hour out of a Top 80, 14.5 litres of fuel would keep you in the air for 9.5 hours! So you have an engine that burns 1.5 - 2.5 litres of fuel per hour, but why does the fuel burn vary? Things like altitude, air temperature, and humidity will all make a small difference to the fuel consumption, but the main factors are listed below. Some wings have a better glide ratio than others, meaning you will require less power to stay airborne, thus using less fuel. Some wings create more drag than others, meaning you will use more fuel. There are many factors that will affect your fuel economy, so if you're looking for a better range, some research will be necessary before buying a wing. If you're flying into a 12 mph wind, your ground speed will be very slow, and the distance you'll be able to fly will be decreased. On the other hand, if you're flying in the same wind, but in the opposite direction, you'll have a very fast ground speed, and a very good range. If you climb and descend a lot throughout your flight, you're fuel consumption will increase, decreasing the distance you'll be able to fly. If you takeoff and climb to 500 feet, and maintain this altitude throughout your flight, you'll have a much better range. Things like turning lots will also affect your fuel consumption and range, the straighter your flight path the better. Your use of speedbar will also make a difference to your speed and fuel consumption. So how far can a paramotor fly? 217.5 miles! Sounds pretty precise right? Let's find out how we came to this conclusion. Let's assume that you take off to zero wind, and you fly with trims open and no speedbar. This will give the average paramotor wing a top speed of around 30 mph. You have a full 14.5 litre tank of fuel, and you're flying the Top 80. You climb to 500 feet and fly in a dead straight line to where you want to go. The Top 80 burns between 1.5 and 2.5 litres of fuel per hour, so we'll go for the middle number, and say you're burning 2 litres per hour. So you should be able to fly for 7 hours 15 minutes on a tank of gas, giving you a range of 217.5 miles, not bad ay? Now, the wind will never stay at zero mph for over 7 hours, you won't stay at exactly 500 feet, and you'll have to make some turns, so this isn't going to be completely accurate. But you can see that a paramotor can actually have an amazing range. That's good, but I want to fly further! With cross country and adventure flying becoming ever more popular, I know that there are going to be many people reading this who are thinking - "217.5 miles, is that all?" While 217.5 miles is all you can expect from a single tank of fuel on a foot launch paramotor, there are ways of increasing a paramotors range even further! Long distance pilots, record breakers, and more recently pilots competing in the Icarus Trophy, have been racking their brains on how to increase their foot launched paramotor's range. There's two options: option 1 is to do what Miroslav Oros from the Czech Republic did in order to fly a massive 5,674.35 miles. With this option you simply fly as far as you can on a single tank, land near to a fuel station, or a planned refuel point, then takeoff again. This is how most cross country pilots do it, and it's how Miroslav was able to smash the world record back in 2011, and it still hasn't been beaten. Option 2 is to fit or carry a fuel bladder on your paramotor. This is something that's become very popular with Icarus pilots. The Icarus Trophy is a 1000 mile, unsupported paramotor race, so pilots need to stay aloft for as long as possible. Some pilots have used a 6 litre fuel bladder which they attach to their chest. After a few hours when their regular tank has half emptied, they connect the fuel bladder while in-flight. This links to the main tank to let the fuel flow from the bladder to be used as normal. Others have designed and attached a second tank to their paramotor. These also supply extra fuel into the main tank, but the pilots are required to pump the fuel through by using a fuel primer bulb. How far can a paramotor trike fly? A paramotor trike is a great way of increasing your flight time and range, without sacrificing power and thrust; and they're a popular choice with cross country pilots for this very reason. 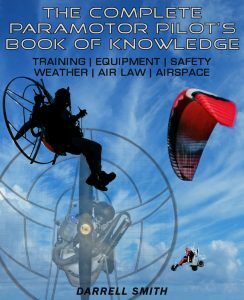 Whereas a foot launched paramotor is limited by the weight a pilot can carry, a wheeled machine is not, this means that they can carry much more fuel. As with a foot launched paramotor, the choice of engine and wing will affect your range, as will everything else we looked at earlier. But some trikes are capable of over 5 hours flight time as standard. Bare in mind that a trike fitted with an engine like the Vittorazi Moster, will not be able to fly for as long as a foot launched machine with the exact same amount of fuel. This is because the trike will be much heavier, which means it will require more fuel to stay airborne. The extra weight of a trike will also mean that it flies faster, this means that you will require a higher RPM, thus burning more fuel. So trikes and quads will carry more fuel, but they'll also burn more. So how far can a paramotor trike fly? Let's take a Blackhawk Lowboy 3 with an Intruder 250 cc 4-stroke engine. This engine burns 4.3 litres of fuel per hour, and it's super powerful, so 4.3 litres per hour is fantastic fuel economy. It has a 21 litre fuel tank if you choose the upgrade, meaning it will fly for 4 hours 52 minutes. Remember that you'll be flying faster on a trike like this, so we'll go with 35 mph. This means you will be able to fly for 170.8 miles on a single tank of fuel. Pretty good for an engine that produces over 100 KG of thrust! Now you know the range that's achievable on a paramotor, find out how to choose your first paramotor HERE. GO HERE if you like the sound of long distance flying! Check out the 5 best engines available HERE.